Styled after the Native American tepee, and later, the U.S. Army’s “Sibley Tent,” Stout Tents are built with heavy canvas and thick groundsheets that keep warmth in and critters out. Image courtesy Stout Tent. When Jim Stout ordered a bell tent purely to entertain his kids in the backyard, he set it up – and sized it up. Quality details were lacking. Pressure points were not enforced. He’d mutter about how this seam needed a box stitch or that seam needed different thread. What kind of man obsesses over such details? A man who sewed parachutes in the U.S. Army for eight years. “His technical background in sewing wasn’t always something he bragged about,” quips his wife and business partner, Caitlyn Stout. Yet out of his skill set – and the simple purchase of a product he knew he could build better – a business was born. 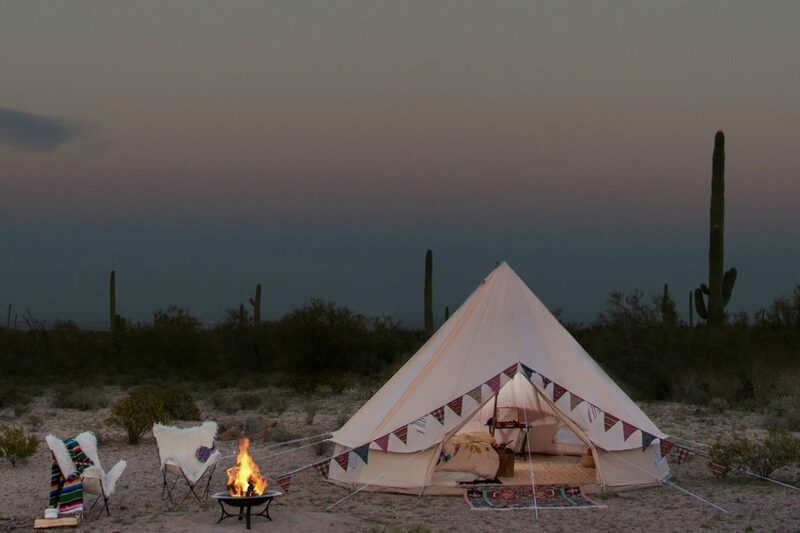 “We decided to start making bell tents,” says Caitlyn, co-owner of Phoenix-based Stout Tent. “We buy our canvas in the states. It’s a really superior product,” she says. She also touts the single-pole, easy assembly design, which she is quick to credit to – wouldn’t you know it – the U.S. Army, which adapted the Native American tepee into a bell tent design in the late 1800s. We get it. For some of you the very idea of roughing it is rough, especially when flashbacks from hidden corners of your psyche hearken to creepy crawly attacks or frigid nights spent inside leaky tents. Still, most us inherently romanticize the notion of sleeping under the stars after a night of tall tales around the campfire. Stout Tent has got you covered with tents that keep the outdoors out. Complete with bug-screened doors, sewn-in windows and thick groundsheets with military-grade zippers that won’t rust, the tents’ sturdy canvas material is treated with waterproofing and fire retardant agents. Several styles are available, including the entry-level Ultimate 4000, the roomy Overland 5000 or the look-at-me Safari Glamping Tent. Stout Tent can also trick out your tent with fade-resistant bunting, a handmade iron chandelier, a front awning, or a frontier wood burning stove kit that fits into the tent’s pre-cut 4-inch hole. Of course, you’ll pay for these touches. But there’s nothing campy about them, or the tents themselves, which range from $750 to $1,786. The majority of Stout Tent customers are individuals or festival-goers looking to up their glamping game. A close second are small specialty businesses that need outdoor spaces for product sales or services such as massage. “It’s a way to avoid permanent building structures and have a much smaller footprint,” Caitlyn says. No matter your intended use, Stout Tents live up to their name. They may have been born from child’s play – but they’re built to withstand it.